Have you ever wished that your child’s favorite thing could be used to teach them their least favorite things? 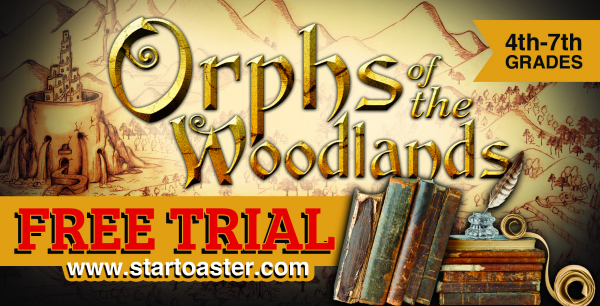 Well, get a taste of it with Orphs of the Woodlands. 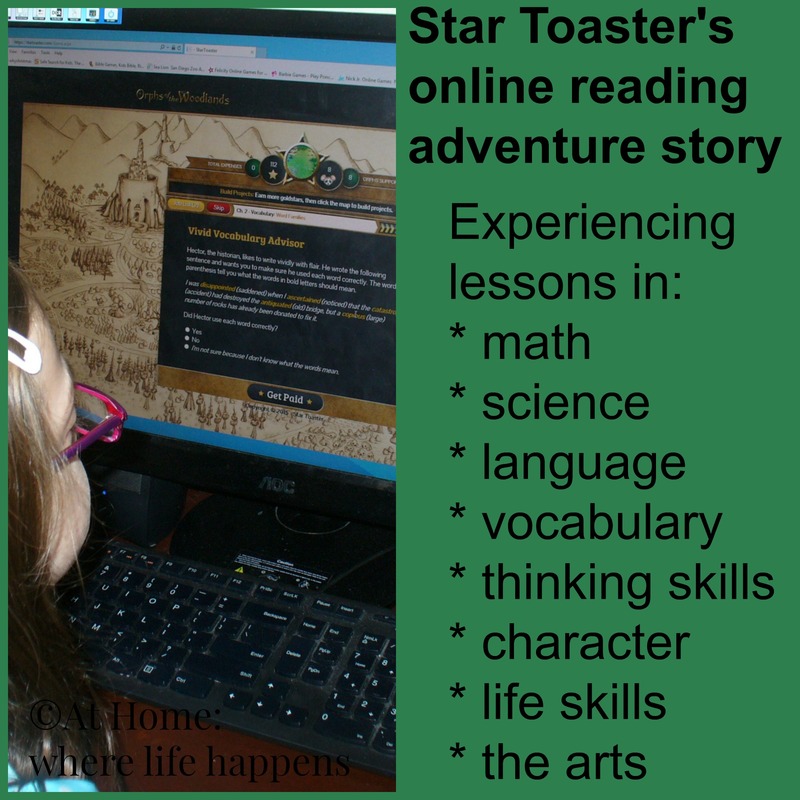 This is an online education resource and game that combines reading with experiencing hundreds of tidbits of knowledge. 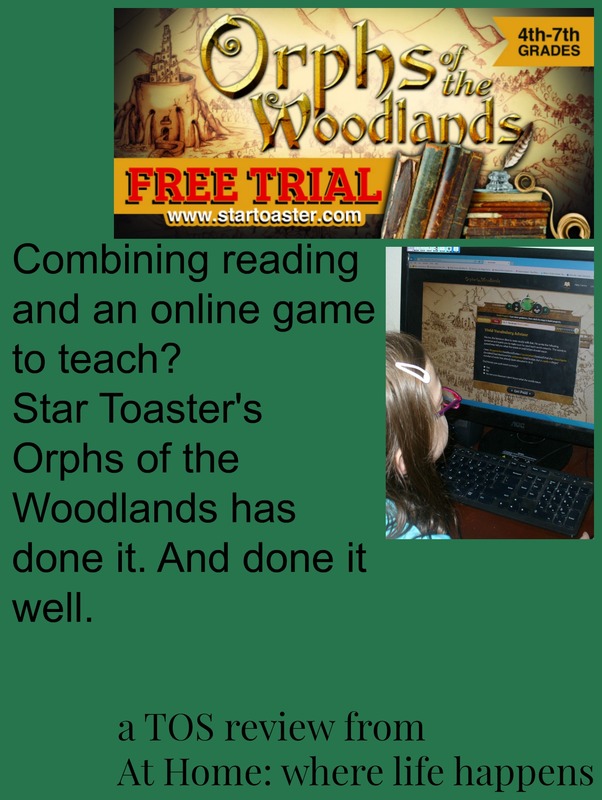 Star Toaster introduced their first book in the Orphs of the Woodlands series not too long ago. It is titled The Treasure of HighTower and our family was thrilled to get the chance to review it. The Treasure of HighTower did not disappoint. Star Toaster has created a story line about a squirrel, whom your child gets to name, that becomes a spy and helps to rescue orphaned forest creatures. The story is so exciting, so full of adventure, that the girls had a hard time not reading all the way through it in pretty quick succession. They wanted to just keep reading. But, if they did that, they were going to miss an important and exciting part of the program. As the story goes along, Spy (what we’ll call the squirrel for the time being) runs into orphans, or orphs, that need help. If Spy doesn’t learn what is put before him in his day to day life, he won’t have the money to provide the help these orphs need. So, Spy must learn and pay attention and do the jobs in order to earn money and rescue the orphs. The more NID (New Information Daily) that is learned, the better Spy does on his jobs and the more money he has to rescue and provide for the orphs. Now, don’t misunderstand. These are fun jobs! I mean, who wouldn’t want to be in charge of creating the exact color of paint needed for the HighTower Highbrow Museum of Art? Or what about being a number namer for the bank? Letter Linguist? Synonym Specialist? Maybe you want to bake something for the Badger Bakery? Whatever you want to try out, there is a job for you! How do you get these jobs? Begin reading the book at the beginning. After each chapter is completed, there are new jobs that you can work. Each job completed correctly will pay gold stars, with which you can take care of the orphs. Do a good job and more orphs will come to be taken care of. The girls loved seeing how many orphs appeared at the end of each chapter. I want to share a couple of thoughts about the product. I am impressed with this product. 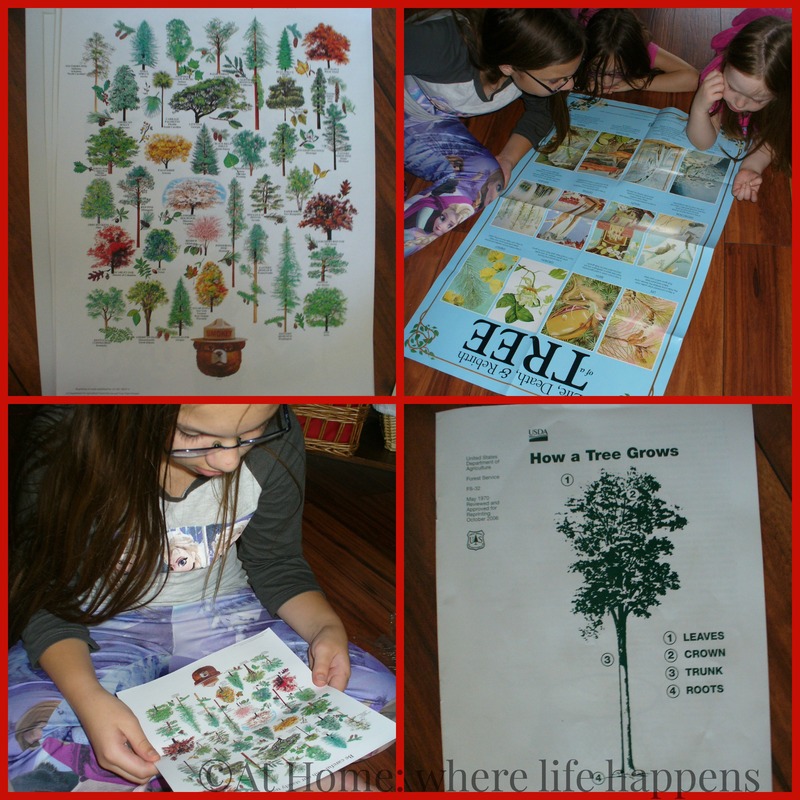 It has done a wonderful job of exposing the girls to about 240 different aspects of learning. (This is how many jobs were completed by E when she had finished the book.) Some of the jobs reappear with a bit more difficult learning tucked in there but I don’t consider the girls to have gotten significant instruction on most of these topics. They were definitely exposed to them and it opened up a world of ideas to the girls, which is fantastic. 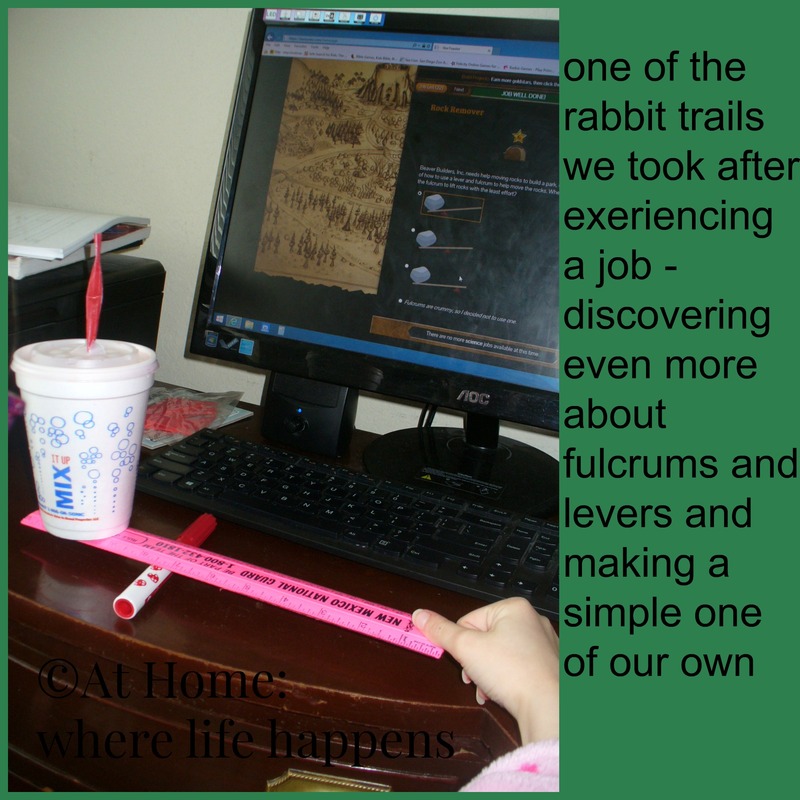 (We took several “rabbit trails” to explore some of these worlds of ideas based on the information presented.) This does in no way diminish the quality or worth of this program. The more exposure the girls have with more difficult concepts in a familiar context, the easier those concepts are for them to learn. Reading is the bridge for this program. You definitely need to have a good reader with good comprehension for this program. The range for this program is suggested 4th – 7th grades. I think this is a good range but it could easily stretch younger or older. My 3rd grader was easily able to read it but she loves to read. There are lots of words she didn’t know but there are rollovers embedded in the story that give the part of speech and several synonyms in varying degrees of difficulty for the word. There are also rollovers for quotes and ideas that are shared as part of the story, exposing the reader to thoughts of great thinkers from all walks of life. Because this is an online program you will need to purchase a subscription for the book and you will need a computer to read and complete the jobs. I hope everyone has easy access to a computer because this was worth the time and effort. The girls learned so much and I have a much better idea about some of the curriculum choices we need to make for them because I saw how much they enjoyed learning that was embedded in reading a story. Connect with Star Toaster on Social Media. Are you looking for some good ‘ol fashioned fun? Word games combined with card games? Snake Oil is it! 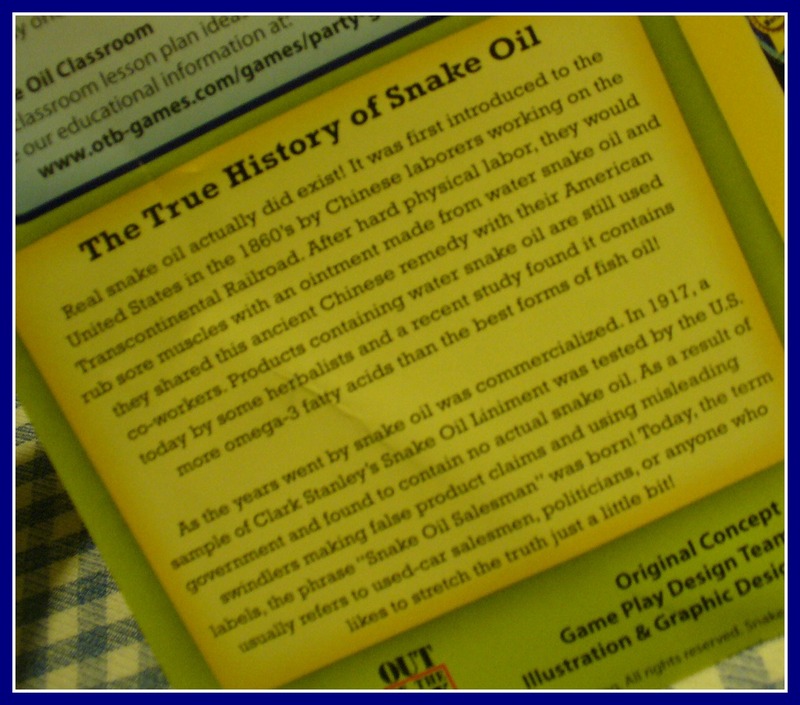 Created by Out of the Box Games, Snake Oil is a fun word game that allows your “out of the box” thinkers to express themselves in a very fun, unique way. I know what you are thinking – snake oil? Really? And the answer is yes, really. It makes total sense, if you get back to the origins of “snake oil.” Check out these words from the instruction sheet, included with the game. So, how do you play? One person is the customer and picks a customer card to determine what kind of customer they are. 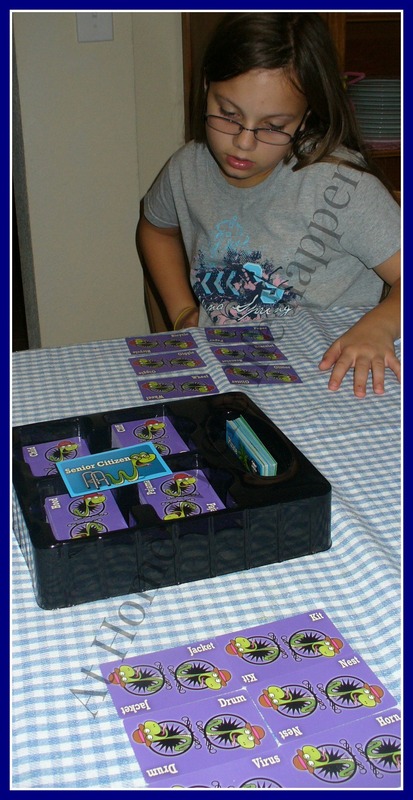 For example, the card may say “diva” or “pregnant woman” or “kindergartener.” The other players have a set of cards with a single word on each; we have been playing with six cards. Each player picks two of the word cards and imagines a new product based on those two words. The player then gives a sales pitch about that product to the customer. Once every player has had a chance to pitch their product, the customer chooses which one of the products he would buy. He gives the customer card to the player that created the most marketable product. The next person then chooses a customer card and play continues in the same manner until every has had a turn to be a customer. We played one variation of the game with just two players because L really likes this game and asks to play it more often than the others like to play. So, she and I play and just take turns making the sales pitch. It is still a lot of fun. This game has been a great family activity. The words are varied. This gives opportunity for a vocabulary lesson at each and every game. The girls have learned quite a few new words and when we learn a new word, we also read the spelling of it a few times to help cement it into our brains. The marketed age on this is 10+. However, we have found with our family, that J (age 5) can play by herself if someone helps her read the words. Independent play is possible for L (age 8). That being said, there are some cards you might want to remove prior to play. 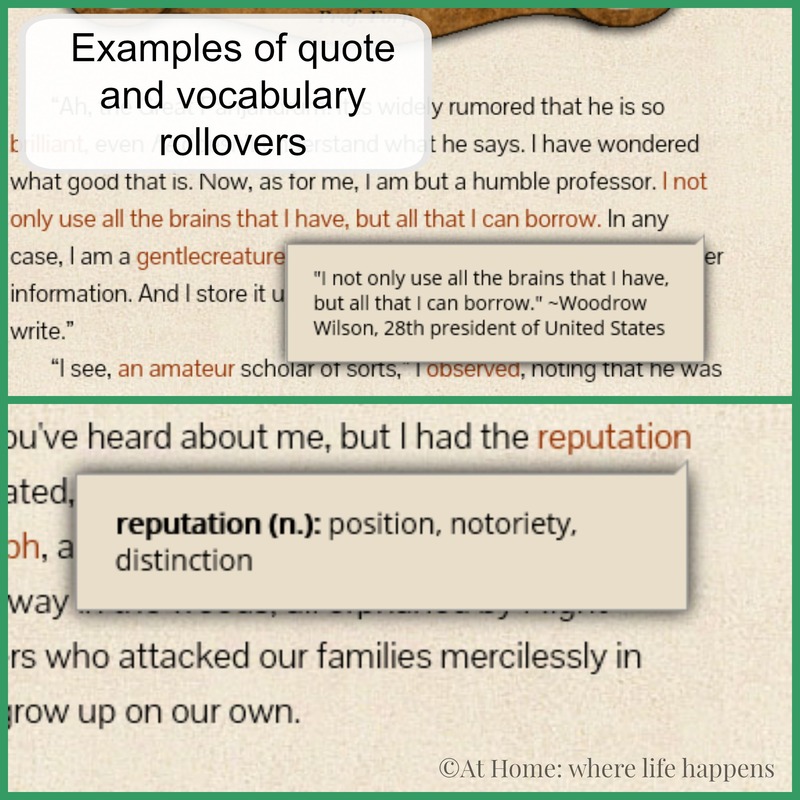 Here are some examples of word cards we have removed and why: rumor (if we are promoting something good, it doesn’t need to include rumor which is not based in fact), greed (an emotion that is negative and can rule lives), bra (don’t really want that in the box with mixed company), revenge and murder (again, both negative, sinful things). There are some others as well, and your choices will be based on your family and the situation in which you are playing the game. Some examples of the customer cards that might be problematic for someone include executioner (the job is not one I desire to get into with my 5 year old and the picture is somewhat disturbing to the girls), witch, zombie, gangster and vampire. Snake Oil retails for $19.99. 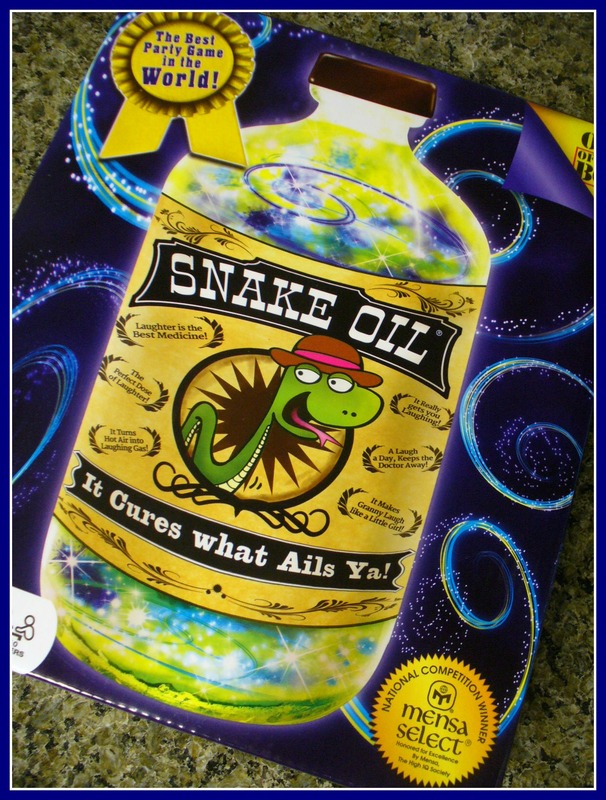 There is also another variation of the game, Snake Oil – Party Potion, marketed for ages 8+. It retails for $14.99. 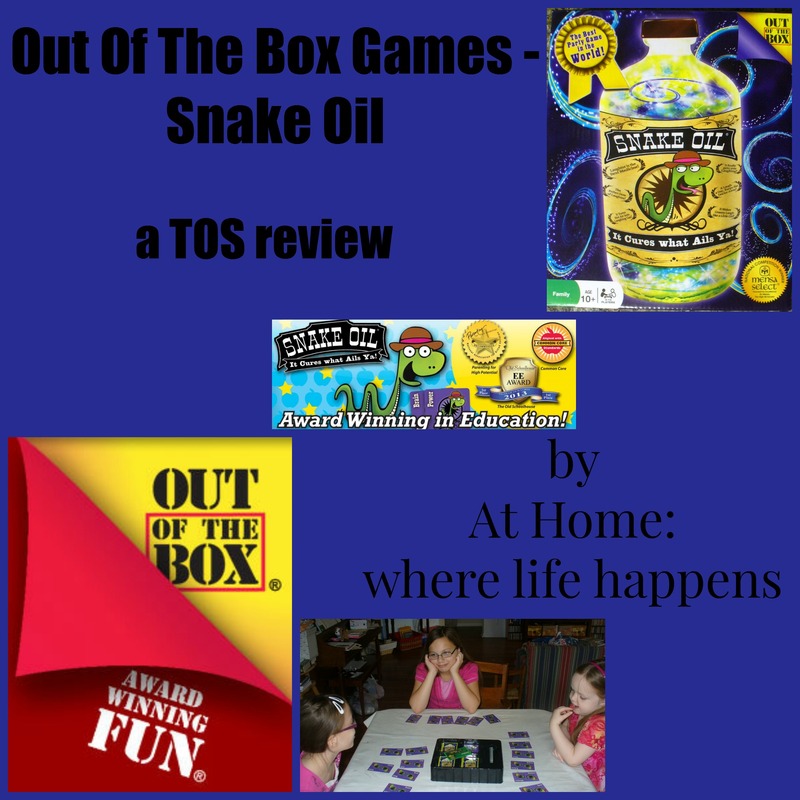 Visit Out of the Box Games to learn more and to view videos of each of the Snake Oil games in play. This has been a super fun, creative way to add word work into our days. The girls have definitely had an increase in their vocabulary and their brains are making new word associations each time we play. We are happy to have this in our games closet and it will be helping the girls imagine all sorts of new things to sell. At Home. Want to read some other families’ views? 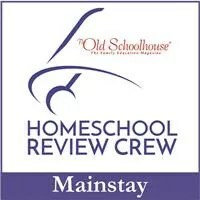 Visit the TOS Review Crew blog by clicking below. Are you familiar with Learning Wrap ups? This is a company that created a unique product years ago to help students learn concepts in any area, from math facts to vocabulary words to music theory to Spanish and more. The product is a plastic card, shaped somewhat like a key with a string attached to it. The student uses the string to connect two things that match or the problem to the answer. The student can then turn it over and self-check the answers. This is a fantastic product and we use a number of these in our home. 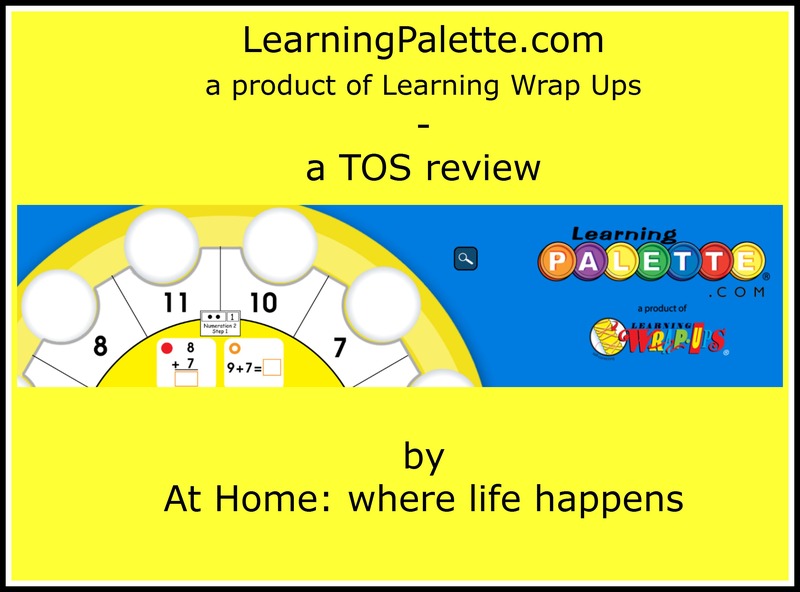 So, when it was announced that Learning Wrap Ups had created a new product, the Learning Palette, and they would be offering an online version so we could have access to all levels of it, we were really excited. 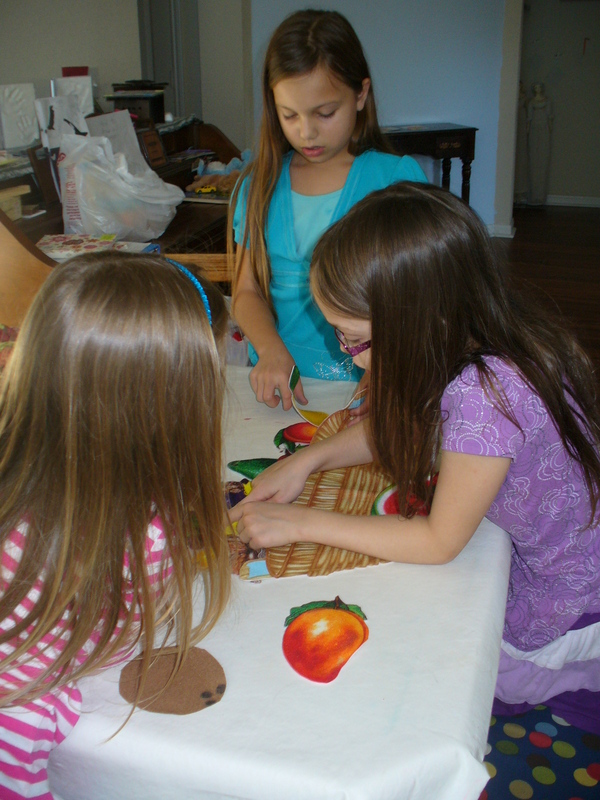 We were selected to review LearningPalette.com and the girls were very excited. Jumping up and down excited. LearningPalette.com is marketed for users in kindergarten up through 5th grade, though the younger end of this group (especially non-readers) will need a significant amount of adult help since there is no audio for instructions. 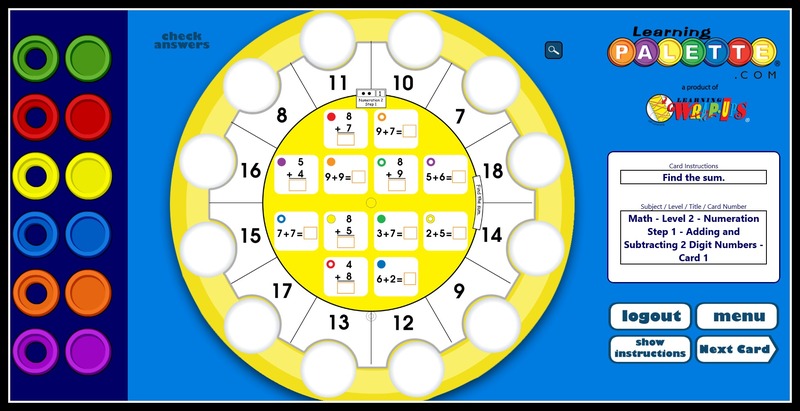 It is a full online family subscription for all levels of reading and math palettes, for up to 5 users, for a full year. The cost of this subscription is $59.99 for the year. LearningPalette.com works like this. Go to their website and login. The student then chooses if they are going to work on math or reading. From there, the student chooses the level they are going to work on and the card that comes next in their series. Then, click load! and off they go. The student matches the problem or question from the center of the palette to the correct color marker. The student then moves that color marker to the corresponding answer. For example, using the picture below, the student would determine that 8+7=15 and that problem has a solid red circle next to it. The student would then locate the solid red circle on the left, click it to move it and click it again in the circle next to 15 to drop it there. This was easy for the oldest giggly girl, at age 10, to understand and use. It was much more difficult however for the middle giggly girl, at age 8, to use. The youngest giggly girl, at age 5, could not do it without a parent sitting right there helping her know which problem she was working on and helping her check which marker she was using for which answer. 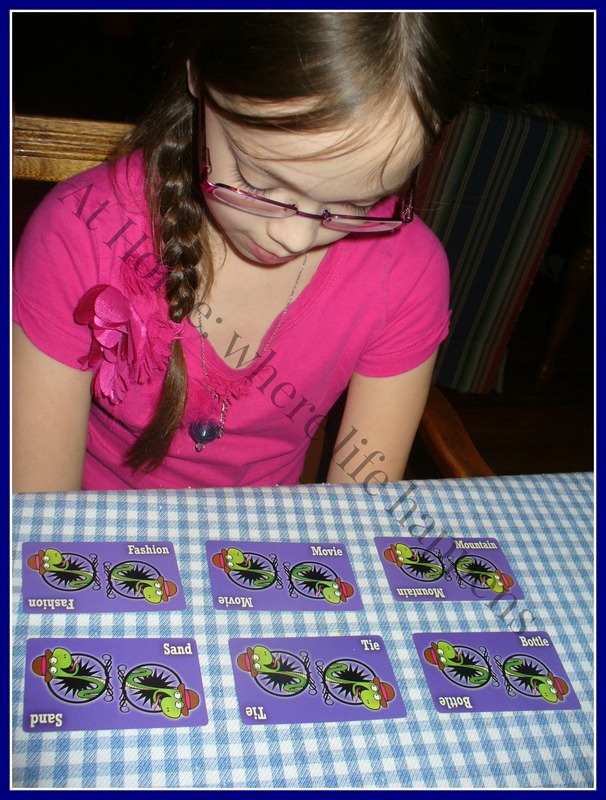 Additionally, the instructions are often difficult for the student to see and understand so a parent will need to be close by to help the student know what she is supposed to do on each card. The girls were really excited to use LearningPalette.com at the beginning. In fact, I was going to ask not to be put on the review until the oldest giggly girl saw the sample. When she saw it, she got very excited and worked with the sample for a long time, just for fun. All three of the girls were excited to use it for a while. However, the enjoyment of it quickly wore off, especially if it was not a review card they were working on. If the card contained information that was not simple for them, it was not an enjoyable activity for anyone. By the end, the product was one that no one wanted to use anymore. The concept for LearningPalette.com is a good one, in my opinion. I think what is missing is the ease of use. It takes work, even for me as an adult, to make sure that I am choosing the correct marker for the correct problem and putting it in the correct answer. That work is not “do I have the right answer?” or “do I know how to do this problem?” The work is simply “do I have the right color?” , “is it supposed to be solid or have a hole in the middle?”, and “did I put it in the right place?” That makes it not so much fun. 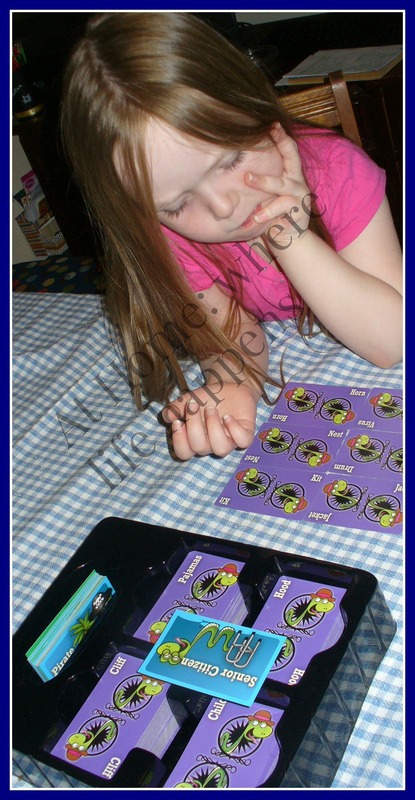 Another frustration that we encountered over and over was the program marking the answer wrong when it was right. This happened on a number of cards in both the math and reading sections of the program. When the card was redone, with the same answers, it might mark it correct that time. There was no way of knowing if you were going to get marked one way or another and the girls began asking if everything was actually right, even when there were checks on each of the problems to indicate it was correct. This is a program that might work better for us if we focused on using it only for “fun time” and “reinforcement”. In my opinion, it does not work as an instructional program but rather as a practice program. We will continue to use it sporadically as a game and something fun to use to do review on concepts the giggly girls already know. If you are looking for an online program, I encourage you to head over to LearningPalette.com and sign up for their demo. See if it is a good fit for your family. Learning Wrap ups is currently offering a coupon code for 20% off of the full price of $59.99 if you use the code HOMESCHOOL when you sign up for a year. That is a fantastic deal! Others on the Review Crew were given physical products to use and review. You can find reviews for the physical products, as well as others who used LearningPalette.com, by clicking on the banner below and visiting the Review Crew blog. In our house, literature is all around us and everyone in the family constantly has at least one book going. That made Progeny Press appealing to us – study guides for literature from a Christian perspective. We have been studying two different books using Progeny Press Study Guides – Little House In The Big Woods and The Courage of Sarah Noble. 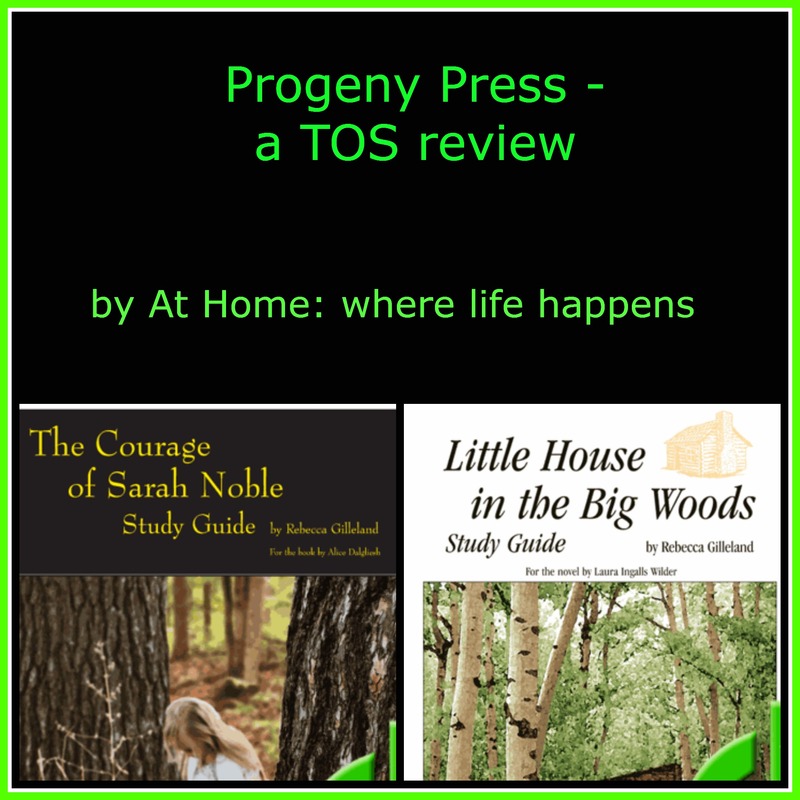 Progeny Press Study Guides have a couple of things in common, even though Little House In The Big Woods E-guide is recommended for use by 4th-6th grade students and The Courage of Sarah Noble E-guide is recommended for use by K-3rd graders. Both of our study guides began with notes to the instructor. 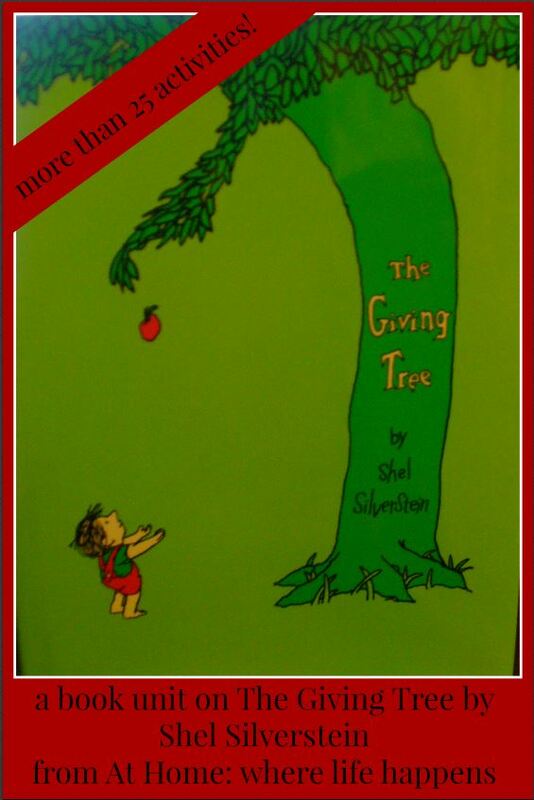 Next is a synopsis of the book and information regarding the author of the book. Following the author’s page, we found facts about the time period and the part of the country that the book is set in. Both of our study guides also included some Before-You-Read Activities, which helped set the tone for the book and guide. Another way in which both of our study guides were similar is that the lessons were set up in groups of 2 chapters at a time. 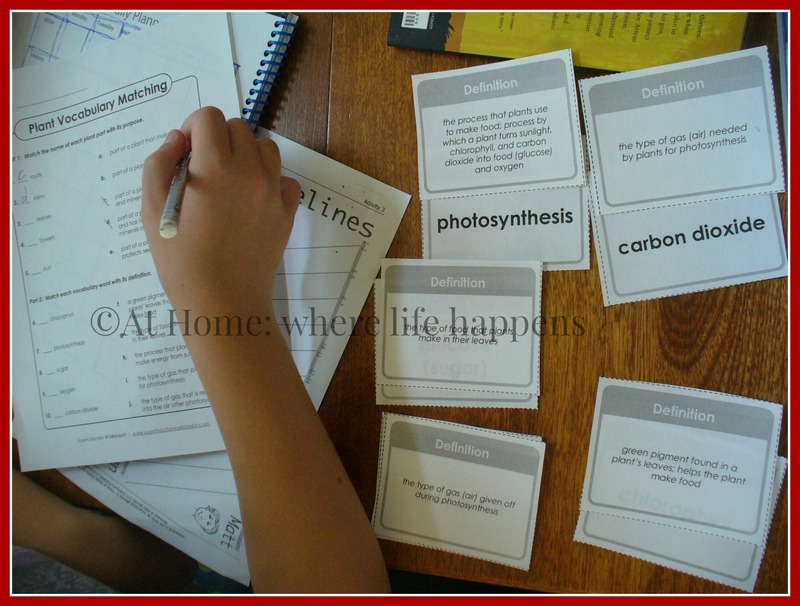 These lessons always included a set of vocabulary words and definitions with various activities to engage the student. These lessons also always included a set of questions, though the set up of these was dramatically different between the K-3 study guide and the 4-6 study guide. We started by having E read the synopsis, the author information, and the background information. We then talked about these things, especially the background information. We completed a couple of the Before-You-Read activities. She searched on the computer for information on Paul Bunyan and read the story of the lumberjack. We also found a video of the Paul Bunyan story that was entertaining. We also pulled out our big US map (remember the one from our states study?) and found Wisconsin on it. That allowed her to review a bit about what Wisconsin is famous for and words that describe the state. The activity in the study guide asked us to study a map of Wisconsin, so we located one of those (actually found one from the Laura Ingalls Wilder museum) and studied where Pepin was (on the Mississippi) and where the forests of Wisconsin were and are currently. Then we jumped into the lessons. Each lesson began with a vocabulary activity, focusing on 5 to 10 words and their definitions within the context of the story. Most of these words are ones that I would have chosen myself because they are used differently or not at all in our society or lifestyle. Some examples of words include kegs (for a barrel to hold items in), sullen, sulked, bored (with a knife), and flatirons. The activities varied from lesson to lesson. In some the word was given and the student was asked to consult a dictionary and write the definition. In another, the student was given a short definition and had to unscramble the letters to find the word. In yet another, the student was given multiple-choice answers to choose from. This variation helped to keep the interest in a task that can be dull and boring. In the questions for Little House In The Big Woods, there are two sections. One is titled Questions. The other is titled Digging Deeper. The Questions section is lower level thinking (information and comprehension levels of Bloom’s taxonomy). These are questions that ask you to repeat information from the book, such as “Where were Laura and Mary’s playhouses?” These were very easy, and therefore actually frustrating for E. She did not want to answer these! She was required to answer a few out of each lesson, but we did not require her to answer all of them because they didn’t really add much to her learning. We spent a lot more time on the Digging Deeper section. These questions focus on the higher level thinking (application, analysis, synthesis, evaluation) and are the types of questions that really grabbed E’s attention. She was required to answer almost all of the questions in this section each time. One thing I liked about this section is the questions were quite different – Bible application, social settings, comparing your life to theirs, and so much more. These are the questions that really create a learning situation for E. An example of questions from this section – “What does each child receive for Christmas? How does this compare to what you normally receive for Christmas? Would you be happy with (what they received)? Why or why not?” These push her beyond simply knowing the answer. These make her think and defend her position. After the Digging Deeper section, the Little House study guide then gave suggestions for activities that help foster further learning and investigation. We did at least one of these from each of the lessons. 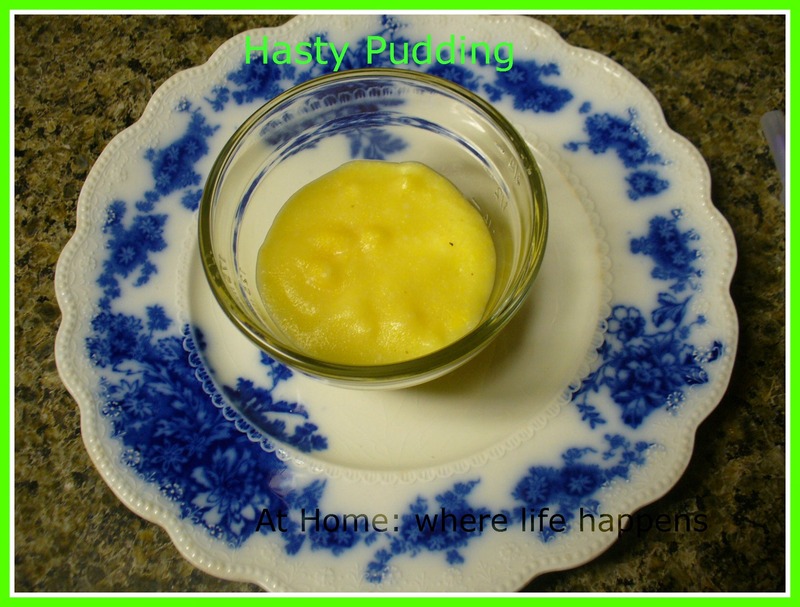 For one E made Hasty Pudding. This is cornmeal pudding, not sweet, but very good with a drizzle of honey over it. 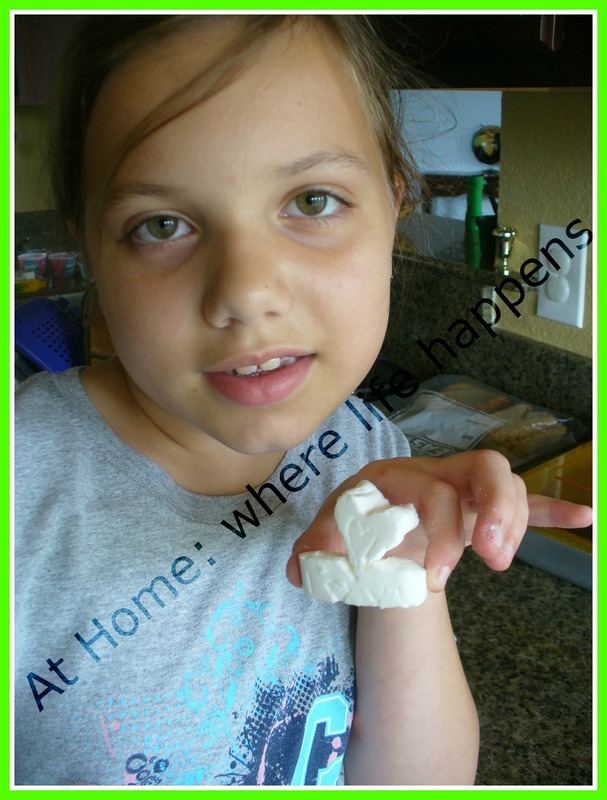 It surprised us and allowed us to talk about the use of sugar during Laura’s time. 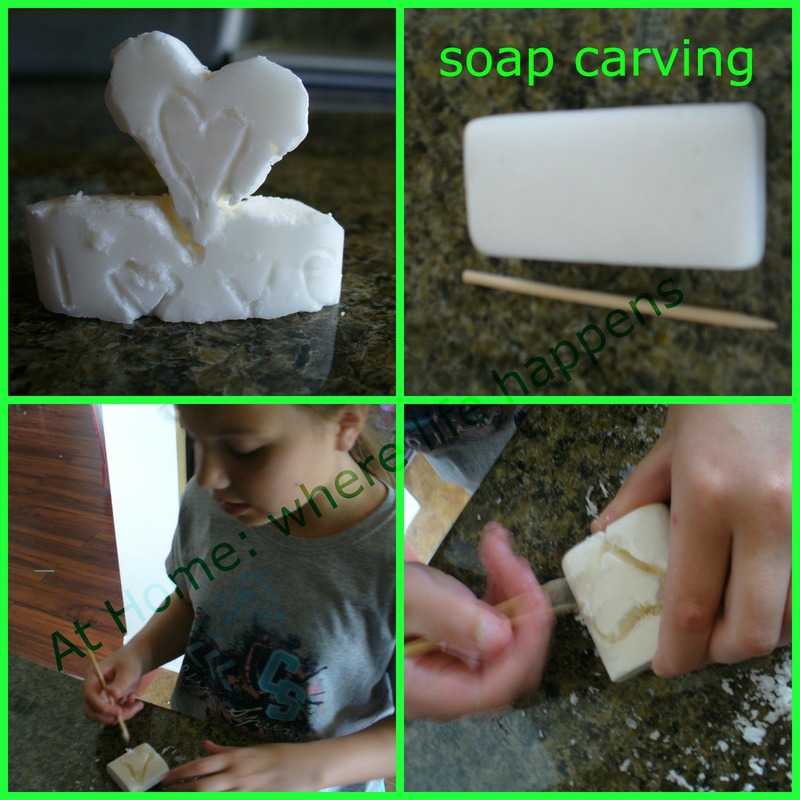 Another activity that she did was carve soap. Pa whittled and carved in the book and this activity allowed her to feel what it was like to carve and create. 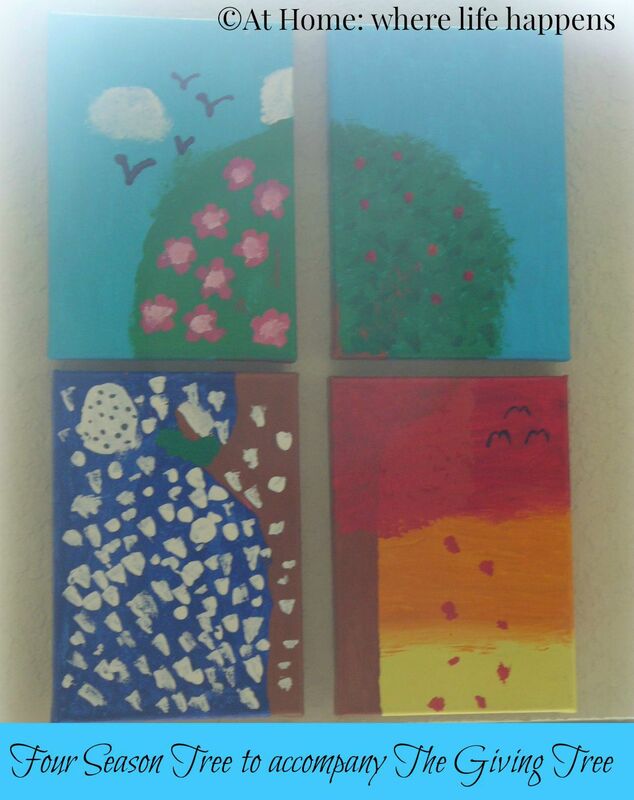 There are 3-4 activities for each lesson and this was our favorite part of each lesson. The study guide finishes up with a crossword puzzle to print and complete. It also has some activities to wrap-up the whole book, including some presentation ideas. We did not make it to this point, honestly. There is so much to these study guides and the activities that we just did not have time to get there, since we had some illness occur during this period. But we made it about 90% of the way through the guide and we will finish it out. One way in which this study guide is different from The Courage of Sarah Noble is that it is an interactive PDF file that you download. You can print out the PDF and the student can write all of her answers on the page. We did this and it worked well. It is also set up so that the student can use the PDF file on the computer and type in her answers. We did this, as well, to see what it was like. This has some definite advantages – you don’t have to print it out and use paper and ink; sometimes typing answers helps the student to be more interested; it can be saved as a PDF file and easily added to portfolios. E liked it both ways and she didn’t have a preference of one way over the other. Personally, I liked that printed out, she did not have to be locked in at a computer. She could take it to the couch, her room, or a table. It is more flexible when printed out, in my opinion. This study guide was used by our middle giggly girl who is 8. She absolutely loved the book. She also read through it all the way the first time she got her hands on it. Again, this is encouraged by Progeny Press. In my opinion, it helps the student get the big picture of the book and be able to put a lot of it in context when it comes to answering questions. I do not think this study guide is as good as the other one we were asked to review. It is for a lower age level but it actually has significantly less hands-on activities, which is more important for K-3rd students. After reading the synopsis, author information, and background information with L, we jumped into the Before-You-Read activities. We pulled out a US map and looked at Connecticut. We talked about what we knew about Connecticut and what the wilderness would be like in the 1700s. We answered some of the questions from this section including things like what it would be like to knock on a stranger’s door to ask for shelter for the night. 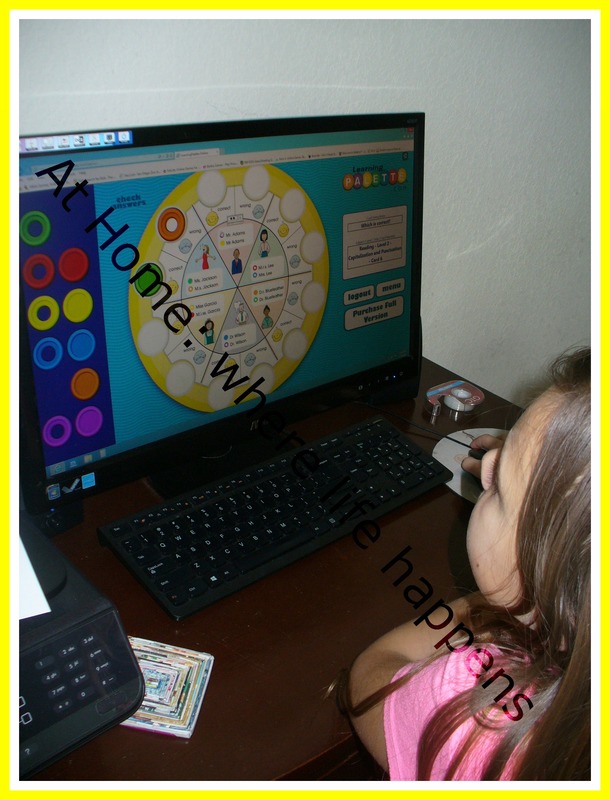 These were good activities to get her mind set on how things were back then as compared to what she knows. This study guide had an activity that the other did not. It included an As-You-Read Activity. It asked the reader to keep a list all the times Sarah Noble reminded herself to keep up her courage. L kept a list of the times she reminded herself with words and a separate list of when she reminded herself with her cloak. This was an interesting comparison and really brought out how often we all need reminded to keep up our courage in difficult situations. As with the Little House study guide, each lesson covered two chapters and began with vocabulary work. There were between 5 and 10 words for each lesson. The vocabulary activities varied from looking it up in a dictionary and writing the definition to matching a word to its definition. The words chosen often represented words that we don’t often encounter such as palisade, namesake, and musket. They are great words and, again, are the kinds of words I would have chosen myself. The Questions section was structured differently, as well. It only had one section of questions. This section included questions from all thinking levels. There were informational level questions next to analysis questions and evaluation questions next to comprehension questions. This was interesting in that it kept her thinking with different processes throughout. She did not like answering the questions at all but it wasn’t because the questions were not good; I don’t know why it didn’t fit her well. Some examples of questions include “Why do you think Tall John was looking sadly at her?” and “What did her father tell her was the best courage of all?” One part of the questions section that I really liked was that it included some application of Bible verses. Since this is an area our family focuses on, I like that this was included for each chapter. The Sarah Noble study guide ended with three hands-on learning activities. 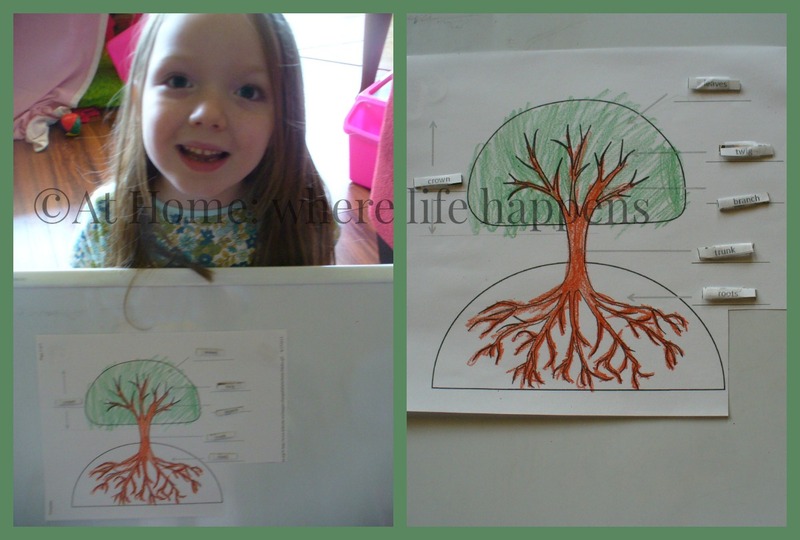 Activities like these are good but I wish there had been activities like this for each lesson, not just at the end. It would have improved this greatly and perhaps L would have enjoyed it more. 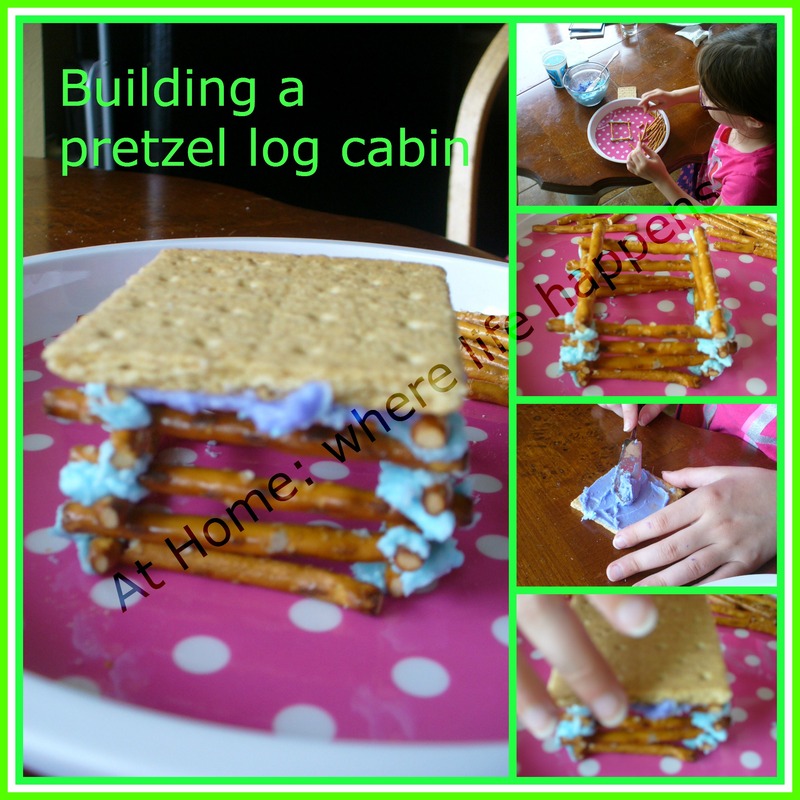 L created a log cabin out of pretzels and icing. 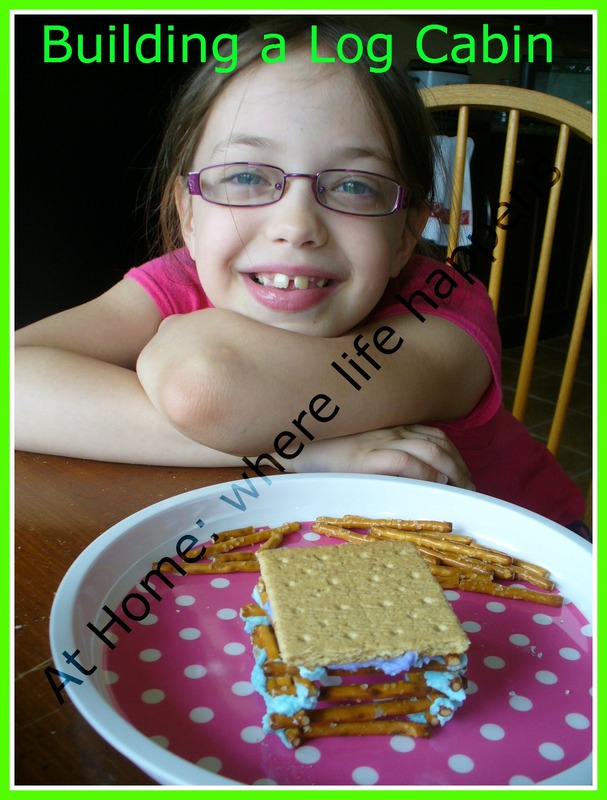 It was a great learning activity because she realized just how much thought and work has to go into building a house from logs, how many problems can occur. For art, she is going to create a collage of Sarah and her father in the woods. There is also a pebble game similar to that which the Indians might have played with Sarah. This activity actually held no appeal for L so we skipped it. 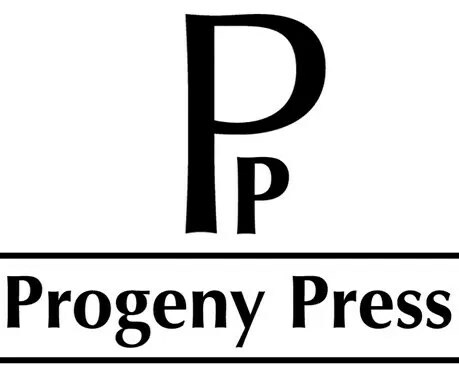 To purchase a Progeny Press study guide, visit their website at http://ProgenyPress.com. Their website is easy to navigate and you can easily find what you are looking for. The study guides we used were both digital downloads. Little House In The Big Woods is priced at $16.99 and is an interactive download. The Courage of Sarah Noble is priced at $11.99 and is not interactive. Once you have purchased these, you can download and save the file to your computer. You then print what you need/want or open the file for the interactive PDF, type in your answers, and save it to your computer. If you have any questions, their FAQ is easy to read and gives a lot of information. * I say this often but I will say it again: pick and choose to fit your student and your family. These study guides have a lot in them! The oldest giggly girl, E, did not enjoy or need the lowest level thinking questions, meaning those where you are just repeating information from the book. We did not complete every single question. However, in the Digging Deeper section of the Little House study guide, she had to think and apply the information, compare information, or use the ideas from the book in a different way. We did a lot more work in this section because it was more interesting to her and she got a lot out of it. 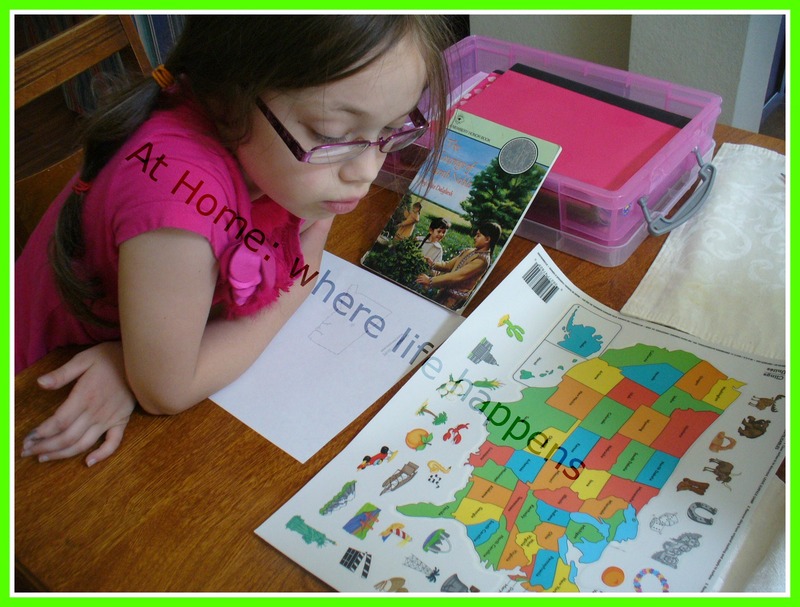 * These guides are more of a worksheet learning style. I think the guides for K-3 would benefit from a lot more activities and fewer questions. These would fit a family whose learning style is question/answer or a family whose students are older (middle-school/high school). At this time, we are not planning on purchasing more of these study guides. They really do not fit our family’s style of learning. I can see that these will be very good for older students and I do foresee us purchasing from this company when the girls are older. At Home. To see more reviews on these study guides or study guides for different literature selections from Progeny Press, click on the banner below. 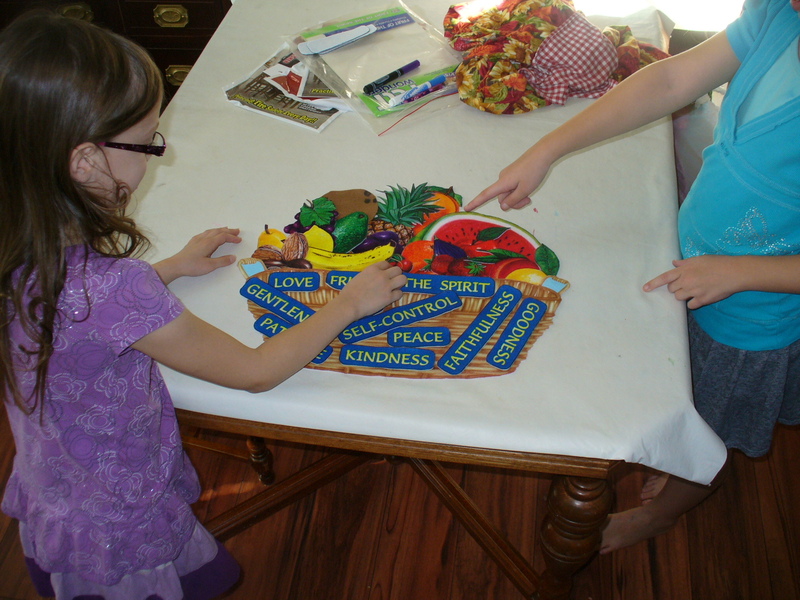 We started this day’s study with a felt activity we borrowed from the church workroom. This was a fun, no-right-no-wrong-way-to-do-it activity. I just handed them the package and let them go at it. They played. 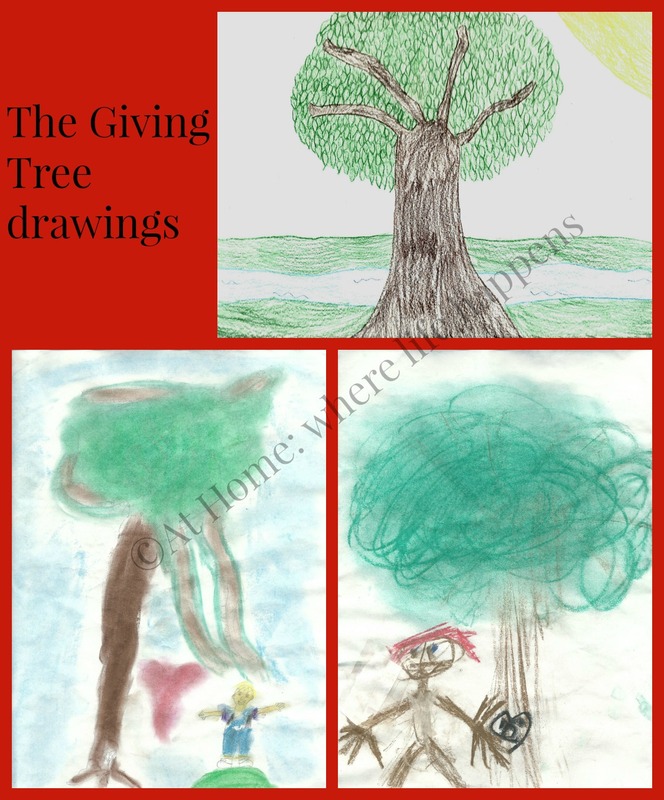 They worked together (showing kindness – yea) and put it together several different ways. They have even pulled it out a few times since then. It is by Little Folk Visuals and is called Felt Wonders – Fruit of the Spirit. It is bright, colorful, durable, and lots of fun. After they had free time with it for a while, I did step in and direct a little bit. We used the small words (love and joy) as reading practice and some phonics work with J, who is beginning to read a bit. We also did some sequencing with the older girls. Of course, we sang the song and they took turns pointing to the words and putting them in order. The set also comes with different words for some of the fruit since different translations of the Bible use alternate words. So, there was a short built in vocabulary lesson. Additionally, we talked about the part of speech for each of the words. After they had played for a while, we did put it away and moved on with the written part of the lesson. 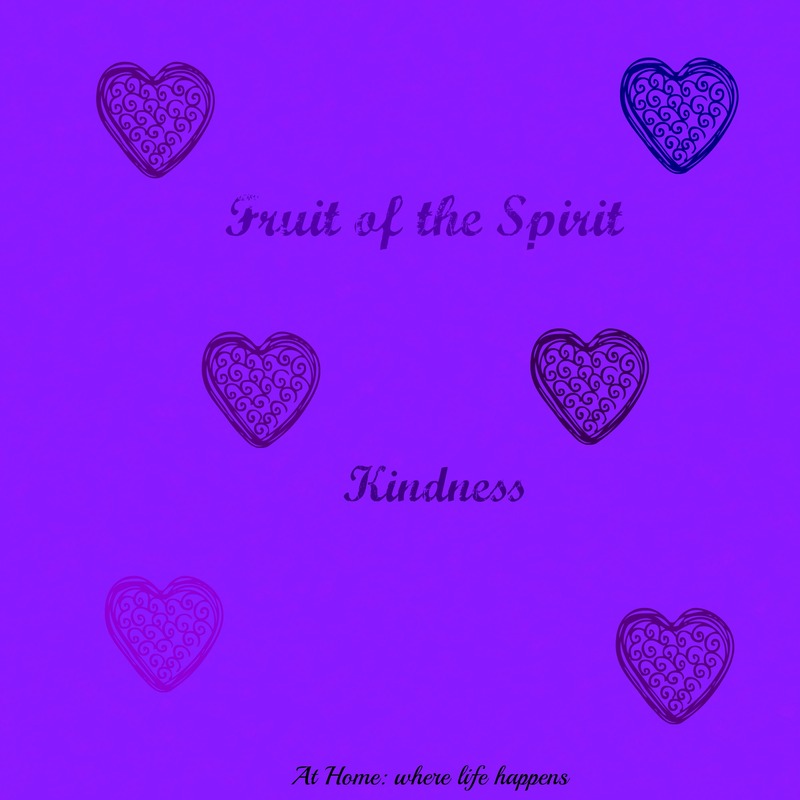 The rest follows the same format as the previous parts of the Fruit of the Spirit study, except there is not a printable coloring sheet or activity sheet this time. Here’s hoping you are able to find some use for these ideas and that they will bless your students. At Home.